Ministers responsible for Labour, Keith Scott and Volda Lawrence at the head table. Also waiting on RUSAL were General Secretary of the Guyana Bauxite and General Workers’ Union, Lincoln Lewis and union President, Leslie Gonsalves. Government must now consider another strategy for engaging Russian bauxite company, RUSAL, which was a no-show at a meeting scheduled Wednesday morning at the Labour Department between that company, the Labour Ministers and the Guyana Bauxite and General Workers Union (GBGWU). “Upset and annoyed,” were the words used by Keith Scott, Minister in the Social Protection Ministry, when he met with the press corps at the Ministry’s Brickdam office. Scott has responsibility for labour issues. RUSAL is the parent company of partly state-owned Bauxite Company of Guyana (BCGI). The friction between Bauxite workers and the employing company has gone on for years. Industrial action by some 60 workers in 2009 saw the company seriously considering the accusations of workers who claimed inhumane working conditions as well as BCGI management’s unwillingness to negotiate wages and salaries. Since then, the company has been accused of dismissing workers and serving letters of suspension if there was any sign of resistance. “We are not taking any sides” but it is the Ministry’s job to preserve a healthy industrial climate, Minister Scott noted in the presence of Social Protection Minister Volda Lawrence, other labour officials, and representatives of the bauxite workers’ union. Scott said, through its absence from the meeting, the company has “shown contempt” not only for the work and position of the Ministry but also of the Guyana Government. The Government is adamant RUSAI must be able to indicate why they were absent from the meeting which they were invited to by written invitation. “The trade union community is not surprised at RUSAL’s refusal to turn up,” General Secretary of the Bauxite workers’ union, Lincoln Lewis, told the press corps. “We as Guyanese have to search for common ground to see how we are going to deal with a group of people who have decided they are going to treat workers anyhow and flout the law of this country,” Lewis concluded. On the way forward, Minister Scott said the government will continue to engage RUSAL and has already forwarded to that company this country’s constitution, labour laws, and details on how the company has violated those documents. 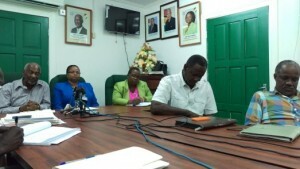 Scott said any further decision from the Guyana government would be based on a collective decision of the Cabinet. When asked about possible industrial action, Lewis skirted around the question saying he cannot say what will be the next steps for the union. RUSAL has maintained that the GBGWU no longer represents workers at that entity, while the union and government have maintained that the union is the legal bargaining agent in keeping with the Trade Union and Recognition Act.